Producer: Warsteiner Brauerei Haus Cramer KG. Description: Grey and green-yellow crown cap. 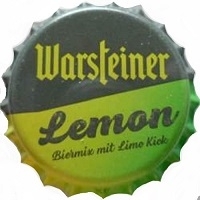 Text: Warsteiner in yellow and Lemon Biermix mit lime Kich in grey.